During emergencies, the fragile healthcare infrastructures in many developing countries cannot address acute injuries while continuing to manage chronic illness. Potential interruptions in antiretroviral therapy (ART) for people living with HIV are serious concerns because continuity of treatment is critical to prevent transmission and ensure individual and community health. 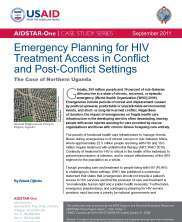 This case study documents Uganda's planning process for continuity of HIV programs in the event of emergencies and highlights changes to the process since the violence from northern Uganda's civil war ended. JSI/AIDSTAR-One, 2011.